in Custom Search results. If you provide in-page metadata markup, via RDFa, Microformats, or PageMaps, the Custom Search platform extracts the metadata attributes and returns these as PageMaps in your XML results, so you can render these structured attributes in your search results. Now, our metadata support just got a whole lot better! If you use the Custom Search Element, you can now add publisher-provided links to your search results based on specific metadata markup in your web pages. These special structured data objects, such as Thumbnails and Actions, are generated from the PageMaps you provide. For example, Scribd, one of our partners, provides both Thumbnails and Actions in PageMaps on their pages, so we display both of these in our sample Custom Search engine, as shown below. The Actions in this case are "Download" and "Fullscreen View", but each publisher can provide customized actions, which they can also style via CSS. If you markup your own pages, as shown above, the Element will render your Thumbnails and Actions in your own Custom Search engine. The above example shows how easy it is for you to add valuable metadata to your pages for use in display in Custom Search results. 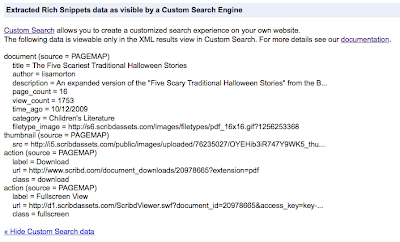 So, in the sample engine that we used above, here's what the result looks like when you type the query [halloween]. We see a set of nicely formatted results that match the query. Let's break down the more:pagemap:document-author:lisamorton restriction. The more: operator is what we use for refinement labels. The pagemap: tells us to refine results by specific attributes in the indexed PageMaps. The document-author: qualifier tells us to look for the specific attribute of interest - the document DataObject in the PageMap with child attribute called author. This is followed by lisamorton, which is just the actual value that we are using for the restriction. You can use this open-ended syntax for querying the appropriate DataObjects in your own documents. You can provide hooks in your application to filter results by attributes that are important for your users, so users will not have to type these restriction qualifiers directly. Check out the Rich Snippet preview tool. This tool allows you to view not only the Rich Snippets markup recognized for Google web search, but also the additional customized markup that we support in Custom Search. You can immediately see how your web page will be processed after indexing, and what metadata attributes will be returned in PageMaps in your Custom Search results. If there are any errors in your markup, you can fix them right away! Remember - you need to add the &view=cse parameter to this tool to review the additional metadata extracted by Custom Search. Many customers have asked for additional structured capabilities, richer snippet presentation and filtering and drill-down capabilities in Custom Search. We'd love to hear feedback from you on these structured data features that offer you more power and flexibility to help users find what they are looking for on your site. Earlier this year, we announced support for Rich Snippets in Custom Search results. If you provide in-page metadata markup, via RDFa, Microformats, or PageMaps, the Custom Search platform extracts the metadata attributes and returns these as PageMaps in your XML results, so you can render these structured attributes in your search results.